Everett Frederic Morrow, the son of John Eugene Morrow, a library custodian who became an ordained Methodist minister in 1912 and Mary Ann Hayes, a former farm worker and maid, was born on April 9, 1909 in Hackensack, New Jersey. He graduated from Hackensack High School in 1925, where he not only served on the debate team for three years, but was their president his senior year. Morrow attended Bowdoin College between 1926 and 1930 and at the time was one of only two African American students enrolled there. Morrow did well academically, but was forced to withdraw his senior year to help his family. He worked as a bank messenger on Wall Street and then secured a social work job. In 1935, Morrow joined the National Urban League as a business manager of Opportunity Magazine, and two years later became field secretary for the National Association for the Advancement of Colored People (NAACP), traveling across the nation to promote membership and fundraising. Morrow entered the United States Army as a private in 1942, and was promoted to sergeant within a month. He subsequently graduated from Officers Candidate School a year later, and was discharged in 1946 as a Major of Artillery. Morrow graduated from Rutgers Law School with a Juris Doctor degree in 1948. After a clerkship in Englewood, New Jersey, Morrow briefly returned to active duty in the armed forces during the Korean War. In 1950 Morrow joined the Columbia Broadcasting Company (CBS) as a public-affairs writer. In 1952 General Dwight Eisenhower’s Presidential campaign hired Morrow as a personal adviser and administrative assistant. After the election he was appointed advisor on Business affairs in the department of Commerce, a post he held until 1955. 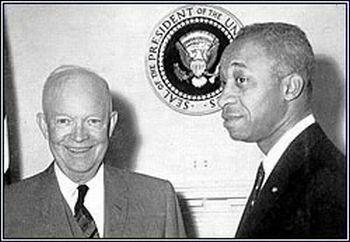 In July of 1955, E. Frederic Morrow became the first African American Presidential aide in history, serving as Administrative Officer for Special projects on President Eisenhower’s staff from 1955 to 1961. E. Frederic Morrow faced difficult personal and professional struggles at the White House as the sole African American in a time of racial tensions related to public school integration. The Supreme Court’s landmark Brown v. the Board of Education ruling in 1954, the Montgomery Bus Boycott from 1955 to 1956, and the Little Rock Crisis in 1957 were the backdrop for Morrow’s White House years. He was often frustrated and angered that many qualified African Americans were excluded from high-level political positions in government and the private sector. Although he found relations within President Eisenhower’s staff to be "correct in conduct, but cold," Morrow’s executive position in the White House was nonetheless an important symbol of racial progress. After his service in the White House, Morrow became Vice President of the African-American Institute in New York, a privately endowed educational-cultural agency. In 1967, after working with The Bank of America for three years, E. Frederic Morrow was the first African American to be promoted to Vice President of its New York based international subsidiary, specializing in foreign loans and business development. He retired as a senior Vice President in 1975, and later worked as an executive for the Education Testing Service in Princeton, New Jersey. E. Frederick Morrow died on July 20, 1994, at Mount Sinai Hospital in New York at the age of 88.